The Vikings, looking to upgrade their receiving corps, chose Flatley in the fourth round of the 1963 NFL draft (the Denver Broncos took him seventh in the AFL draft). Lacking great speed, he had displayed outstanding technique as a college receiver and moved immediately into Minnesota’s starting lineup as a rookie. Vikings went 5-8-1 to finish in a tie for fourth place in the NFL Western Conference. 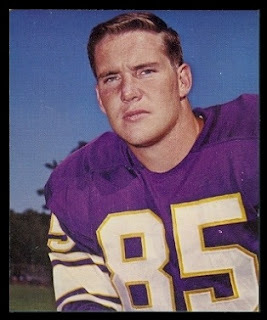 Flatley suffered through an injury-plagued season in 1964 and caught just 28 passes, but bounced back with consecutive 50-catch years in 1965 and ’66 (for 896 and 777 yards, respectively). He was named to the Pro Bowl in 1966. However, his reception total dropped to 23 in ’67 and, with the faster Gene Washington waiting in the wings, Flatley was dealt to Atlanta in 1968. He played three seasons with the Falcons, catching 45 passes for 834 yards in ’69, finishing up in 1970. For his career, he had 306 catches for 4905 yards (16.0 avg.) and 24 TDs.